The Greenpower VWT is a, web based, Virtual Wind Tunnel. 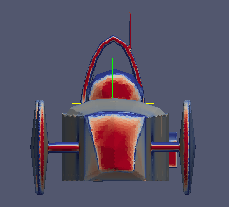 It allows pupils to test their 3D car design models in a, software implemented, wind tunnel and investigate the aerodynamic features in an easy to use environment. The system uses Computational Fluid Dynamics software algorithems running on a remote network of parallel processing computers. This uses heavy weight mathematics to simulate the airflow over the models shape in a virtual wind tunnel. The system is web based. This simplifies usage of the system as no software has to be installed on local workstations, except for a suitable 3D CAD program of the users preference and optionaly, a 3D data viewer. Beam Ltd, provides this system free of charge to schools taking part in the Greenpower challenge in an effort to promote engineering to pupils in the UK. Currently due to resources it is limited to just a few Greenpower teams. To use, the Grenpower cars model design has to be drawn, to scale, in a suitable 3D CAD program. Programs such as Autodesk Inventer, Siemens SolidEdge, PTC Creo, FreeCAD, Google Sketchup or Blender can be used. The input to the VWT is a STL file which is exported from the 3D CAD program. The model is then simulated in the virtual wind tunnel. The VWT software will calculate the models drag force in Newtons, the frontal area and Cd values as well provide data for a 3D data viewing package to allow streamers, arrows and coloured "hot spots" to be shown enabling users to gain an understanding of the nature of the airflow over their designs.